Strong power & torque: The NC750X's liquid-cooled, inline-twin engine incorporates numerous advanced and patented technologies. To ensure strong acceleration, ease-of-use in the city and a relaxed character on the highway, the engine delivers exceptionally strong low-rpm performance. The engine's unique design creates a muscular, easy-to-use powerband not unlike that of a big-bore cruiser. Strong performance - less shifting: The six-speed manual transmission complements the powerband by using wide gear ratios—no need to be constantly shifting up and down to maintain strong performance. Distinctive sound and feel: To give the engine a satisfying and distinctive sound and feel, engineers thought way outside the box. An extra balancer shaft was added to inject the engine with just the right amount of “good" vibration. The effect of the twin balancers is to counteract vibration from higher rpm inertia, making the engine feel more refined, yet still with the distinct “throb" delivered by its 270-degree firing order. The intake-port layout inside the cylinder head was carefully designed to create an intentional interference between adjacent ports, which results in subtle combustion variations. In addition, the timing for the opening and closing of the intake valves was set differently for each cylinder. The result of all this? An engine that always lets you know what it's doing and has a pleasant sound and feel. 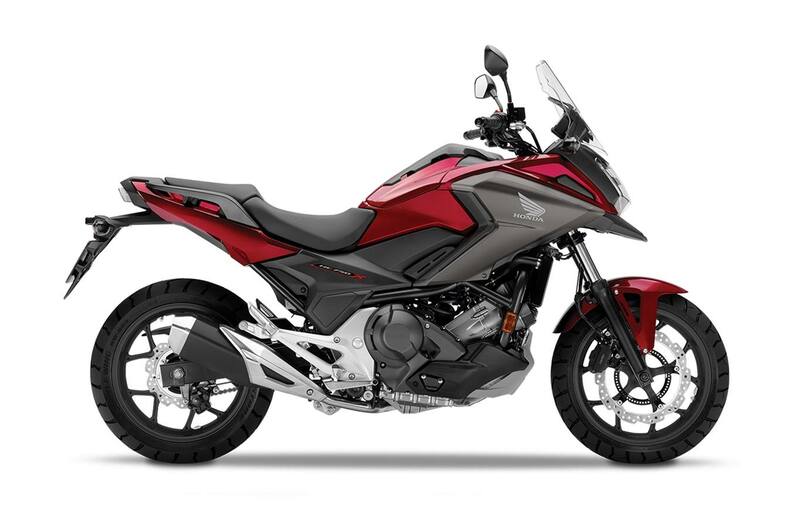 DCT transmission: The NC750X is available with Honda's sporty DCT transmission, which allows both paddle-operated manual operation and three levels of automatic shifting. DCT even senses whether the bike is travelling uphill or downhill and selects shifting points and engine braking accordingly. Adaptive Clutch Capability Control assists in on/off throttle situations, reducing pitching motions for smoother riding. Free space & terrific handling: The engine's inline cylinders are canted forward by 62 degrees to help create a low overall centre of gravity for nimble, confidence-inspiring handling, and also to create room for a convenient central storage area where the cylinders and fuel tank would typically be. Smaller can be better: The engine's efficient use of fuel enables the use of a smaller-volume, more-compact fuel tank that still allows ample riding range while giving engineers extra freedom to re-think the optimal placement of other components. Tuned flex for a smooth ride: Although lightweight, the diamond-shaped steel-tube frame was carefully designed to be very sturdy while also allowing just enough flex to respond smoothly to changing road surfaces. This results in a smooth ride while also letting you feel what the bike is doing. You get comfort when you're just cruising, and a sporty, fun ride when you're on your favourite twisty backroad. Excellent steering leverage & comfort: Seat height is 830 mm and the riding position is upright and neutral, with a high viewpoint for enhanced hazard perception. Another advantage of this adventure-style riding position is great low-speed control—combined with the low centre of gravity and generous steering lock, the result is exceptional low-speed handling and balance. Upright & relaxed: Like the engine, the chassis is all about creating a ride that's fun and user-friendly. The seating position is comfortably upright and relaxed, and the chassis geometry allows the NC750X to manoeuvre nimbly through the city or on winding cottage roads. Showa fork: A Showa dual bending valve fork performs much like a high-end cartridge fork, providing similar smooth action and linear damping force, but at a lighter weight. The result is superior road holding and ride comfort, plus reduced front-end dive under braking. Adventurous styling: The NC750X shows off its edgy styling with an agressive front cowl design, LED taillight, and a tall protective windscreen with venting to reduce pressure and turbulence. The result is a bike that's is comfortable when cruising at speed, with the windscreen and bodywork diverting wind around the rider to minimize fatigue. Large-capacity hidden storage: Where the fuel tank would be on most bikes, the NC750X instead has a large-capacity (22 L), lockable utility compartment that's big enough to hold an XL-size helmet. Don't want to carry all your gear when you arrive at your destination? This handy compartment allows you to quickly stash your helmet, gloves and more out of sight.